Many countries have reduced their corporate income tax rates or introduced tax deductions, exclusions, and credits to attract foreign direct investment. This column discusses the introduction of the Notional Interest Deduction in Belgium, which allows companies to deduct from their taxable income an interest that is calculated based on the company’s equity. The deduction has increased employment in Belgian affiliates of multinational enterprises by between 6% and 8%. During the last few decades, most countries have intensified their economic integration. The production process has internationalised, and trade flows have increased. The rise in foreign investments by multinational enterprises (MNEs) has been an important part of these global value chains. Increasingly, firms have chosen to locate production, head offices, R&D activities and sales across more than one country. Research has analysed the response of FDI to differences in corporate taxation across and within countries (Hines 2017). These studies focus on the location choice of foreign subsidiaries (Barrios et al. 2012, Becker et al. 2012), the relocation of taxable income of multinationals operating in high-tax countries to tax havens (Gumpert et al. 2016), or on the impact of tax reforms on the investment decisions (fixed assets) of foreign affiliates (Egger et al. 2015). In contrast, our recent work (Konings et al. 2018) analyses how employment in foreign MNEs in Belgium is affected by taxation. Simultaneous changes in corporate tax rates and the corresponding tax base blur the effects of how international tax competition affects employment and FDI. We therefore exploit a change in the legislation, in particular the introduction of a tax credit, the ‘Notional Interest Deduction’ (NID), in Belgium. The NID allows companies subject to Belgian corporate income tax to deduct an interest that is calculated on the company’s equity from their taxable income.1 Previous research on the impact of the NID has focused on its impact on the capital decisions of firms. It indicates that the NID has been successful in reducing the indebtedness of Belgian firms, especially among the largest firms (e.g. Panier et al. 2013, Hebous and Ruf 2015). An important goal of the NID was to keep and attract foreign jobs to Belgium. Therefore we focus on MNEs in Belgium, and look at the effects of the NID on the equity and employment decision of these firms. In line with previous research we find that, in the Belgian affiliates of MNEs, the average equity-to-total-assets ratio gradually increased from 2005 onwards. 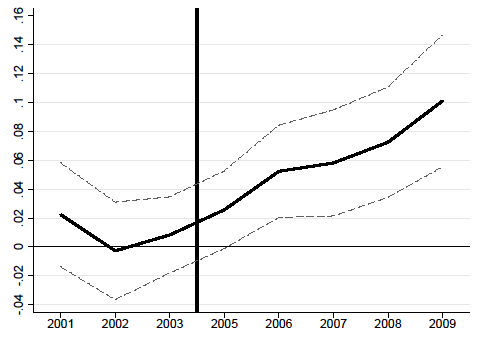 Figure 1 shows significantly higher ratios from 2006 onwards. The higher equity-to-total-assets ratio corresponds with the introduction of the NID in 2006 and supports the empirical evidence that MNEs increased their equity in order to fully benefit from the NID deduction. Source: Konings et al. (2018). Our methodological approach uses difference-in-difference estimation to exploit the introduction of the NID in Belgium. It compares the employment of foreign affiliates in Belgium with the affiliates of the same MNEs in France. This approach allows us to control for characteristics of affiliates that do not change over time, such as average size, sector and institutional context of the country in which it operates. Affiliates in France arguably operate in similar markets and are under control of the same corporate management and culture as affiliates in Belgium. The evolution of the institutional context in France – labour costs and corporate income taxation – also follows the Belgian situation closely at this time. It is therefore reasonable to assume that affiliates in Belgium and France belonging to the same multinational group are competing for the same investments from the parent firm. The only important difference is the introduction of the NID in 2006 for the affiliates operating in Belgium. Hence, the introduction of the NID system may trigger different behaviour in allocating equity across affiliates with potentially real effects on employment growth. The introduction of the NID was unexpected, and thus exogenous and unrelated to the existing employment level of firms in Belgium. Figure 2 shows the results of this quasi-natural experiment. 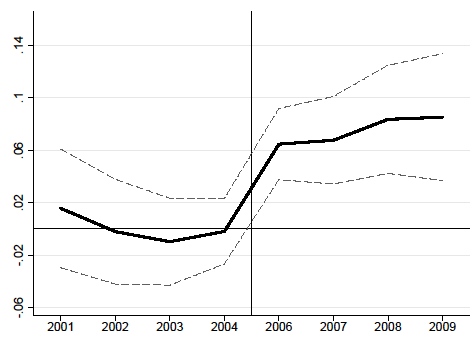 We find significantly higher employment levels in affiliates of MNEs in Belgium from 2006 onwards. The increase in employment (about 7%) shown in Figure 2 was most pronounced in the first year following the introduction of the NID. But it was also maintained between 2007 and 2009. Our analysis therefore shows that MNEs respond swiftly and substantially to changing international tax policies. Our analyses show that tax competition matters for employment decisions in MNEs. The Belgian tax deduction on equity has also reduced the indebtedness of foreign MNEs in Belgium. This deleveraging process may be important, in particular after the crisis of 2007 and 2008, which was characterised by high corporate debt ratios and political interest in tax deductions for corporate equity in Europe. The Common Consolidated Corporate Tax Base, recently relaunched by the European Commission, includes an allowance for corporate equity named the ‘Allowance for Growth and Investment’ (AGI). While an EU-wide tax deduction for equity seems beneficial for the financial stability of firms in the EU, a single set of rules to set the corporate tax bases of firms also removes most of the taxation instruments (tax credits, deductions, exclusions) that countries use to compete for MNE activities. This may create fiercer tax competition between countries, and a race to the bottom on corporate income tax rates. Barrios, S, H Huizinga, L Laven, and G Nicodème (2012), “International Taxation and Multinational Firm Location Decisions”, Journal of Public Economics 96(11-12): 946-958. Becker, S O , P H Egger, and V Merlo (2012), “How low Business Tax Rates attract MNE Activity: Municipality-Level Evidence from Germany”, Journal of Public Economics 96(9-10): 698-711. Egger, P, V Merlo, M Ruf, and G Wamser (2015), “Consequences of the new UK Tax Exemption System: evidence from Micro-Level Data”, The Economic Journal 125(589): 1764-1789. Gumpert, A, J R Hines, and M Schnitzer (2016), “Multinational Firms and Tax Havens”, The Review of Economics and Statistics 98(4): 713-727. Hebous, S and M Ruf (2015), “Evaluating the Effects of ACE Systems on Multinational Debt Financing and Investment”, CESifo working paper 5360. Hines, J R (2017), “Business Tax Burdens and Tax Reform”,Brookings Papers on Economic Activity: 449-471. Konings, J, C Lecocq, and B Merlevede (2018), “Does a Tax Credit matter for Job Creation by Multinational Enterprises?”, CEPR Discussion Paper 13105. Panier, F, F Pérez-González, and P Villanueva (2013), “Capital Structure and Taxes: What Happens When You (Also) Subsidize Equity?”, working paper. The notional interest deduction comes on top of the companies’ interest deduction on debt and aims at reducing the tax discrimination between debt financing and equity financing, the so-called ‘debt bias’, by making investments financed by equity much more attractive. It does however not contain any obligation to invest in intangible or tangible fixed assets. Many firms already increased their equity at the end of 2005 in order to benefit from the NID from 2006 onwards. Therefore, 2004 is a better reference than 2005 for the analyses of equity-to-total-asset ratios.